The camera battery has evolved, and more is involved now than picking up a pack of AAs at the drugstore. Many cameras use specific batteries that can only be found at camera or computer stores. Although many cameras can use alkaline batteries, they have a short life, so whether you use proprietary batteries or batteries from the drugstore, rechargeable is the name of the game. Save the alkaline batteries for a backup. The majority of cameras now require a certain style of battery for a particular camera. Battery styles vary by both manufacturer and camera model. Search for "Nikon battery" or "Canon battery" on the internet, and you'll find many different shapes of batteries even within that particular manufacturer's product line. Some types are for point-and-shoot cameras, while others are for DSLR cameras. Fortunately, most DSLR cameras by one manufacturer use the same style of battery. This equivalence is convenient when you upgrade camera bodies because you can usually use the same batteries in your new camera that you did in the old camera. A few cameras, mostly point-in-shoot models, continue to use common battery sizes such as AAA or AA. Some DSLR cameras can be fitted with a vertical grip accessory that holds two of the brand's proprietary batteries and can also be adapted to fit the common battery sizes. Check your camera body's accessory list to see if this retrofitting is possible. For cameras that use AA or AAA batteries, rely on the rechargeable version. Although you can use disposables, the power draw is such that using disposables exclusively can be costly if you make regular use of your camera. Nickel metal hydride (NiMH) batteries are more efficient than the older nickel cadmium (NiCd) batteries. NiMH batteries are more than twice as powerful, and they have no memory effect, which reduces the maximum capacity of future charges if you recharge a NiCd battery before it's fully discharged. 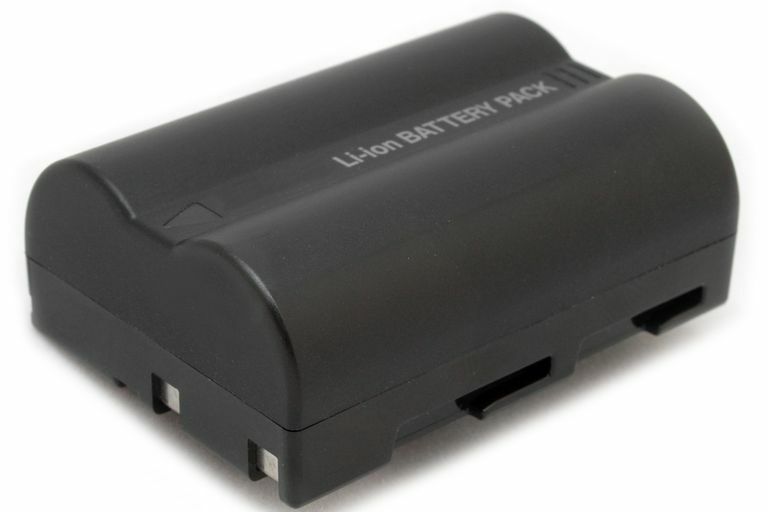 Carry disposable lithium AAs as a backup to your rechargeable batteries. They are more expensive, but they hold three times the charge and weigh about half as much as standard alkaline AA batteries. Rechargeable lithium-ion (Li-ion) batteries are the most commonly used style of battery in digital cameras, particularly in DSLRs. They are lighter, more powerful, and more compact than NiMH batteries, and they aren't affected by cold weather. Their power produces a strong flash for bright photos and an increased flash range over other battery types. Lithium-ion batteries hold their charge for a long time, which is useful if you use a digital camera that requires a lot of power. Lithium-ion batteries are more expensive than NiMH batteries. Rechargeable lithium-ion batteries come in brand-specific formats. A few cameras accept disposable lithium batteries such as CR2s using an adapter. Malfunctioning lithium-ion batteries have caused smoke and fire incidents on commercial flights. As a result, many airlines do not allow them in checked baggage — only in carry-ons. Like lithium-ion batteries, NiMH batteries can be recharged hundreds of times. They are not very expensive, and they recharge in only one to two hours. However, they don't hold a charge for a long time. NiMH batteries are also safer for the environment than Li-on batteries. To extend the life of your NiMH batteries, check out tips for improving battery longevity. Today's camera manufacturers are in the battery business. They produce proprietary batteries under their brand name to assure that consumers get a battery they can trust. Canon and Nikon both produce batteries for every camera they sell, and many other camera manufacturers do as well. As is often the case, generic brands compete in the digital camera market. They are the exact size and shape of the brand-name batteries and often have the same output of power. They are also considerably cheaper. Check reviews on any specific generic battery to ensure that it holds a charge over the long run and does not suffer performance problems relative to its name-brand alternative. No matter which type of battery you choose to use with your digital camera, you can take steps to prevent the camera from using batteries too fast.